India has an extraordinarily rich heritage going back centuries. The Indian National Congress will take further steps to protect, preserve and promote this heritage and ensure that its value is fully appreciated, especially by the younger generation particularly. A statutory National Commission for Heritage Sites will be made fully operational. This will be an important instrument to strengthen the foundations of ourpluralistic culture and inheritances. The UPA Government will set up a committee to examine the question of declaring all languages in the Eight Schedule of the Constitution as official languages. A new category of classical languages has been created and Sanskrit,Tamil, Telegu, Kannada and Malyalam have been notified as classical languages. In a major intervention to further safeguard India’s priceless monuments and archaeological sites, the Central government has recently amended the Ancient Monuments and Archaeological Sites and Remains Act, which prohibits construction, including public projects,within the 100 metre ‘prohibited area’. It has also been stipulated that Heritage Bye-laws shall be prepared for each of these protected monuments so as to regulate building activities in the next 200 metre ‘regulated area’ that lies beyond the 100 metre ‘prohibited area’. A National Monuments Authority is being set up as the apex body to oversee the implementation of the Act. India’s valuable cultural heritage is better preserved and protected. A conscious policy decision was taken to professionalise cultural institutions. Rs. 20 crore has been sanctioned for the upgradation of Sardar Patel’s memorials at Ahmedabad and Karamsad. A project to set up a memorial for Shaheed Bhagat Singh, at his native place at Khatkar Kalan, has been sanctioned at a cost of Rs. 16.80 crore. Rs. 46.38 crore have been released to the Government of Punjab for development of Talwandi Sabo and Anandpur Saheb as part of the concluding phase of the ter-centenary of Guruta-Gaddi of the Guru Granth Saheb. The 150th birth anniversaries of Gurudev Rabindranath Tagore and Swami Vivekananda were celebrated. National Committees under the chairmanship of the Prime Minister have been set up. A significant feature of the 150th anniversary of Tagore is the joint celebration with Bangladesh. A National Committee has also been set up to commemorate the 150th birth anniversary of Pandit Madan Mohan Malviya. A new Tagore Research Fellowship Scheme has been launched to persuade academics, researchers and scholars to devote up to two years of time working with major cultural institutions of the Ministry. 13 national Tagore Fellows have been selected so far. UNESCO has declared three more living traditions of India as shining examples of world’s intangible cultural heritage. These are ‘Mudiyettu’ sacred ritual theatre of Kerala, the ‘Kalbelia’ folk song and dance of Rajasthan and the ‘Chhau’ folk dance of eastern India. The Commonwealth Games (CWG), a mega multi-disciplinary sporting event, was organized at Delhi from 3rd to 14th October, 2010. Competitions were held in 17 sports and 7572 athletes/officials from 71 countries & territories of the Commonwealth participated in these Games. The opening and closing ceremonies were held at the Jawaharlal Nehru Stadium and were commended for their spectacular quality. Commemoration of 150th Birth Anniversary of Rabindranath Tagore/ Swami Vivekananda- As a part of ongoing commemoration of 150th Birth Anniversary of Rabindranath Tagore, Ministry of Culture organized a large number of programmes. A “Tagore Award for Promotion of Universal Brotherhood” has been instituted. Under joint Indo-Bangla celebrations, the cultural troupes from both the countries have visited various locations in two countries and presented cultural events. 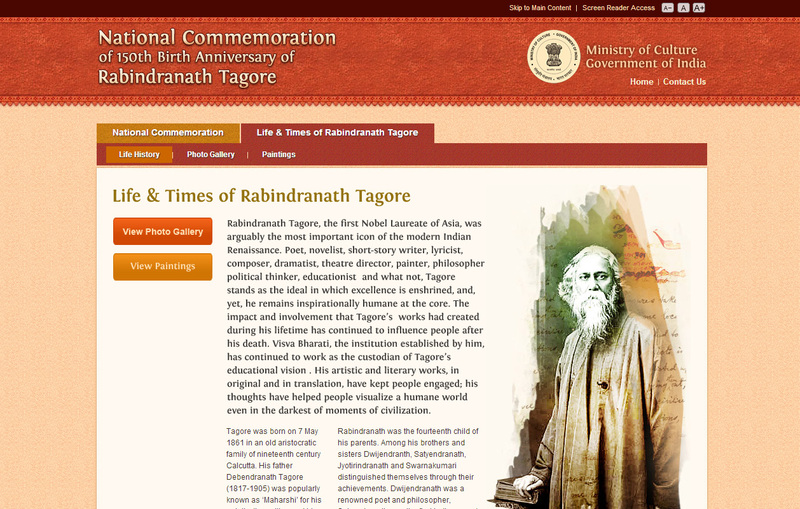 The commemoration elicited a buoyant wave of enthusiasm which showed the receptivity to the ideas embodied by Tagore. Exhibitions of original Tagore paintings were also organized in several countries. Further, selection of 208 paintings from the collections of Vishva Bharati is presently travelling to nine locations abroad, in three circuits, since September 2011. Keeping Tagore’s paintings at its centre the exhibition, also highlighted the holistic persona of Gurudev Tagore through photographs, wall texts and supporting multimedia presentations including screening of films on him. For commemoration of 150th Birth Anniversary of Swami Vivekananda, Ramakrishna Mission, Belur Math is implementing Vivekananda Value Education Programme for propagating the legacy and philosophy of Swami Vivekananda, for which an amount of Rs100 crore would be provided to the Mission. A High Level Committee to be called as National Mission on Libraries has been constituted to advise the Government of India on all library and information sector matters of national importance. A central sector scheme relating to Cultural Heritage Youth Leadership Programme was inaugurated in November 2011 with the objective of enriching the awareness of culture amongst youth, in order to promote cultural awareness mutual understanding and respect, as also to develop a love for India’s rich heritage, with a view to developing appropriate leadership qualities amongst youth. In November, 2011 India was elected as a member of the prestigious World Heritage Committee of UNESCO for a four year term (2012-15).